Receive seasonal offerings, access to exclusive restaurant events, discounts and so much more when you become a BFG Insider. Print coupon or show it to your server on smart phone and get 20% off your entire dinner, excludes alcohol and tips. Get a complimentary Bang Bang shrimp With the Purchase of 2 dinner entrees, valid only on Today. Not valid with any other coupon. One day coupon from Bonefish Grill, includes salad, choice of entree, and dessert. Eat for $40 in Bonefish Grill restaurants and get $10 off. Show coupon to server, excludes tips and alcohol. Receive $40 in coupons to spend in 2017 when you present this coupons and spend $40 or more on dinner. Print and present coupon to your server and get 15% off your next dinner meal at Bonefish Grill restaurants. Valid after 4pm only. $5 discount on lunch on brunch at bonefish grill restaurants. Print or take a screenshot of the coupon on your mobile device and show it to your server to redeem. Print coupon and get a 20% discount on your entire check. Bonefish Grill is all about your traditional classic homemade hearty seafood dishes. Their appetizers are made from scratch daily. Their main menu of entrees has a wide variety of fish selections from Ahi tuna, Chilian sea bass, Tilapia, Scallops to Salmon. 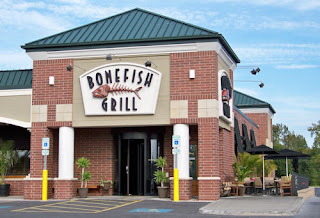 Bonefish grill restaurants is a great place to enjoy with the family and suitable for any event or occasion. Besides their signature seafood meals they are also known for their wood grilled steaks and chops.